A gravatar is a small image, created by the comment author and stored on gravatar.com, that can be displayed with the comment. 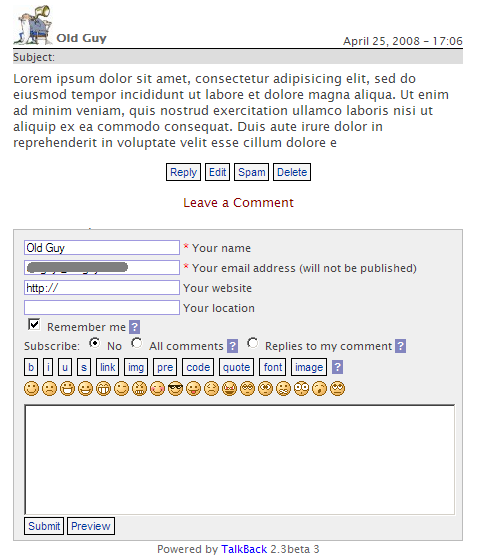 The author’s emaill address is used to retrieve the image from gravatar.com. Visit gravatar.com to learn more about them. Whether or not gravatars are displayed and their size is controlled by configuration settings. If you enable gravatars you must also set styles for them. Some default gravatar styles are in the comment header section of style.css but are commented out. Those styles will produce a layout like this. If an author has not created a gravatar the unknown jpg is used. If you change the default size in the configuration settings you must also resize images/unknown-40.jpg to the new size.